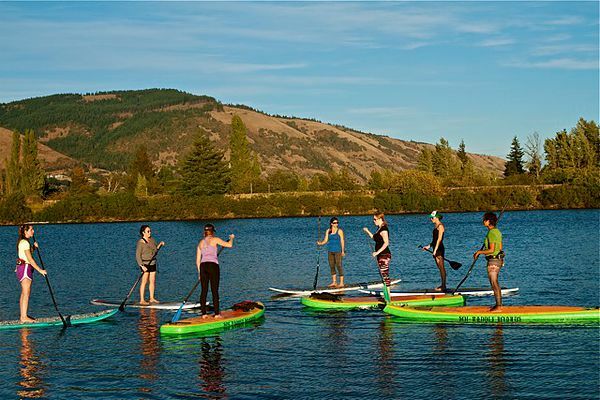 Is a clinic series dedicated to introducing and coaching beginner through advanced water enthusiasts on the Stand Up Paddle Board and in kayaks. Professional Whitewater Kayaker and ACA Level 4 Instructor Trainer Heather Herbeck travels throughout the States and Internationally, inspiring women to fall in love with the water more than they have ever imagined. The tour travels to top paddling destinations in any area that reaches out and invites the clinic into their community. She also has top-notch female coaches assisting along side of her to make your experience even better and keep the coach/student relationship ratio lower. WOWOW is "Women's Outdoor Weekend On the Water!" There are many variations of these clinics from SUP to SUP yoga, all the way to Advanced whitewater kayaking to race training. Heather has been coaching women's clinics for over 7 years, but the WOWOW!!! event began in 2015 in the Columbia River Gorge. The weekend consisted of a Friday evening beginner SUP and SUP yoga session, followed by a weekend of intermediate and beginner kayak instruction. Heather has been kayaking for over 14 years. She states, "I'm not THE top female kayaker in the world with a lot of competition titles, but I am a passionate girl who fell in love with kayaking and just want to share my knowledge of the sport to help progress women more quickly and more confidently in water sports!"